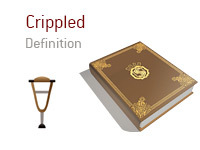 What does the term "crippled" mean in poker? 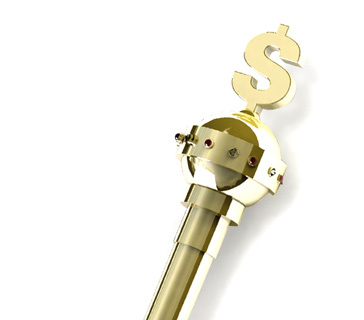 What is the definition of the term "crippled" as it applies to the game of poker? In poker, the term "crippled" applies to when a player is reduced to a very short stack in either a SNG (Sit and Go) or MTT (Multi-Table Tournament). You are playing in a World Series of Poker $1,500 No Limit Hold'em event. There are 17 players left in the tournament, and you have an average stack. Action folds around to you on the button and you look down at pocket Aces. You raise it up. The SB folds, while the BB re-raises after a bit of thought. You showboat and act for a few minutes before electing to put in a fourth bet. You have the BB covered, albeit just very slightly. The BB pushes all-in and you snap call. You turn over your AA, while the BB turns over KK. The board runs out K-7-8-K-2, giving the BB quad Kings. After counting it down, your stack is reduced to just two big blinds, leaving you absolutely crippled. It will now take a small miracle in order to get back into contention in the tournament. That is the definition of the term "crippled" - while you haven't been eliminated as of yet, you are soon to be out the door barring some sort of a miracle comeback.